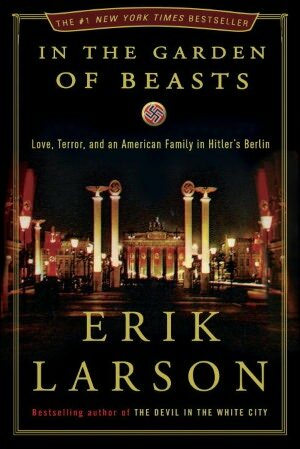 In this historical fiction of American Ambassador William E. Dodd, appointed to serve in Hitler’s Germany by FDR from 1933 to 1937, Eric Larson re-opens one of the most futile, ominous, and turbulent periods in American diplomatic history and a family that would be under relentless public spotlight thereafter. The novel’s title alludes to the famous Tiergarten or Animal Garden in Central Berlin, opposite the Dodds’ residence at the time. Dodd’s background seemed somewhat suited to such a difficult post. He had led a distinguished academic career, had trained at the University of Leipzig for his professorship, had taught in Virginia, and also had headed the University of Chicago’s Department of History (his interests were in the American South, the Civil War, Jeffersonian Democracy and Wilsonian international cooperation). He also advised President Woodrow Wilson during the Paris Peace Conference and favored U.S. participation in the newly created League of Nations (though the U.S. never would join). However, as Adolf Hitler had come to power in Germany through the ballot box, it is doubtful that diplomatic pressures could deflect Hitler from his chosen course as ‘The Invincible Fuhrer’. Thus Dodd was unsuited to either understanding or influencing Hitler’s chosen course as outlined in ‘Mein Kampf’. On a personal basis, (in)famous daughter Martha Dodd (later Stern)’s frivolous conduct with a Russian Intelligence operative ultimately led to his death by execution. Other of her personal relationships also serve to highlight American impotence in the face of draconian measures of Nazi Germany. For more, read Janet Maslin’s May 19, 2011, NY Times book review.